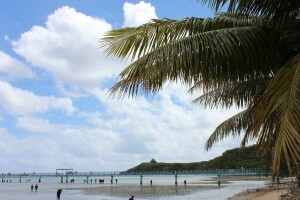 Piti is located on the southern coastal part of Guam just north of the Naval Base Marianas. The village is lush with Guam’s green jungles and mangrove. There are many historical sites and natural beauty the village has to offer you. The coastal waters flourish with marine life and there are numerous of outdoor activities for all your enjoyment. Piti is seven minutes away from both the U.S. Naval Hospital and Navy Exchange. The drive along marine drive to both locations have barely any traffic at any time of the day making the commute a nice scenic drive. For those who are traveling up to Yigo or Dededo, it may take you a bit time with travel time about twenty five minutes. Piti has many preserves and attractions for all your enjoyment outdoors. The Fish Eye Marine Park is an Underwater Observatory Center that welcomes visitors to get a fisheye view of the marine life that flourish under Guam’s waters. Fish Eye is built on top of the Piti Bomb Hole Preserves. The holes are natural coral formations that resemble a bomb hole, attracting many snorkelers and divers on a daily basis. Up the road, Atlantis Guam is a company that offers guests a submarine tour of Guam’s reefs and waters without getting wet in the comfort of a air conditioned comfort. It is quite an experience unlike anything you may have experienced before. Piti Guns is a popular tourist attraction. The three guns date back to 1944 when the Japanese built the structure in Piti to defend the island of Guam. All, we are sure of, is that there are great adventures for any family or friends to surely enjoy. Above the coastline of Piti village nestles the prestigious housing areas of Nimitz Estate, Mama Sandy Drive, and Turner Road. The area is know for the large homes and the spectacular ocean views. In some parts of Turner Road, you are able to see a spectacular view of both the west and east coast of the island which is a magnificent view. Piti promises you the beauty of Guam with its stunning sunsets at dawn and the marine life in its ocean. The people are friendly and the land is crisp clean. We are sure that choosing Piti as your home will be a pleasurable lifestyle, you will not regret it. We hope to see you at the next dive session!